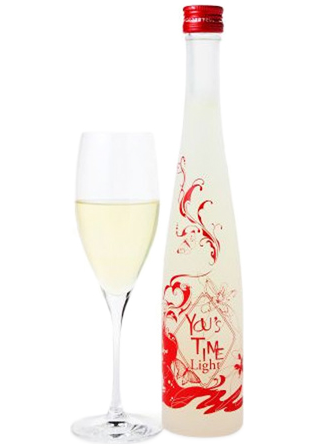 The Best Selling sake from last month is Eikun You's TIME Light ~Yuzu orange citrus liquer. We will introduce this Ginjo sake charged liqueur. You's TIME Light is the citron liqueur charged in Ginjo sake which uses the yuzu juice of Kochi Prefecture(the South West of Japan) 100%. Citron drifts specific fresh scent, you feel a subtle sweetness and flavor in the acidity. It is derived from Ginjo sake easy to drink in the ｒefreshing aftertaste derived from Ginjo sake. It is also ideal for the party seats. Colorful bottle design also are very pleased as a gift to women. "Saito brewing" is a brewery that hand down orally the sake brewing in the land of Kyoto Fushimi (The middle of Japan). Brand "EIKUN" was born in the history of establishment of a business 1895. The natural water for sake in local Fushimi Nanai(The middle of Japan) is a gently smooth taste, and deepen the elegance flavor with passage of time. It is elegant Kyoto liquor that famous clear water and high quality rice brew. By soda, making it easier to drink juice sense. Both cooking in general there are a good match elegance. This goes well with the cooking in general, and is elegance.